There are three static positions in your putting stroke. Because these positions are static, you can model them on best practice. Join them together for an easy-to-repeat back and forward action. Published in 1993, Holographic Golf by Larry Miller has some of the best instruction that I have come across on the golf swing. It should be recommended reading for every golf teacher and student. I have used this concept and applied it to Putting. Larry Miller, a former Tour professional, describes how in the golf swing there are three static positions. If the student can get correctly into each of these positions, everything else in the swing will take care of itself. He reasons that the golf swing moves too fast for the mind to alter it once it is in motion. If your static positions are of poor quality, there is little chance of you achieving a good shot. The same concept of the interconnectedness of the golf swing can be applied to your putting stroke. The completion of your follow-through past impact. Each of these positions are connected in both your full swing and your putting stroke. Each prior position affects the position that follows it. For example, if the top of your backstroke is off plane, you will have to make a compensatory adjustment in your downstroke to bring it back on plane. Fortunately in Holographic Putting the putting stroke is much slower and shorter than the full swing. It is therefore possible to make mid-stroke adjustments. But this only makes your putting stroke more difficult than it should be. Your objective in putting should be to achieve a simple, easy-to-repeat stroke without any compensations. This will give you day-to-day consistency. Good fundamentals essentially relate to a sound setup at address in terms of posture, stance, grip, alignment and ball position. Everyone should be able to model a correct setup as it doesn't require any athleticism. The top of the backstroke typically sees the position of the putter slightly inside the aimline (target line), but remaining on plane. In other words there has been no manipulation of the putterface by your hands and arms. Again it is possible to model this static position. The third static position is just past impact. This is the most important of the three positions. Here your putterface should still be square to your aimline. It should neither be open nor closed. Once again you should be able to model this position. A number of golfers find it difficult to hold their finish through impact before allowing their putter to swing back inside. 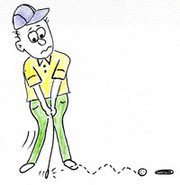 Because they either steer their putter or close the putterface by rotating their shoulders to visually chase their putt, they fail to achieve a good third static position. There is a practice drill that emphasises the follow-through. In this drill you line up your putt and then without a backstroke you push the ball towards the hole. On a short straight putt the only way you will be able to hole the putt consistently is by maintaining your putterface at right angles to your aimline. You do this essentially by riding your left shoulder vertically up rather than rotating it backwards around your body. In summary, to putt consistently you should consider embracing the concept of Holographic Putting. When each of the three static positions is sound, you will be able to put a great stroke on your ball.